With J.J. Klejman, New York, 1962. Mr. R. Esmarian, New York. Gift to Mrs. Hilda Janssens. By descent to her oldest sister, Ann Janssens Shper. By descent to her daughter, the present owner. The Sèvres factory records differentiate between plaques mounted in furniture (plaques) and those intended to be hung on the wall as paintings (tableaux). 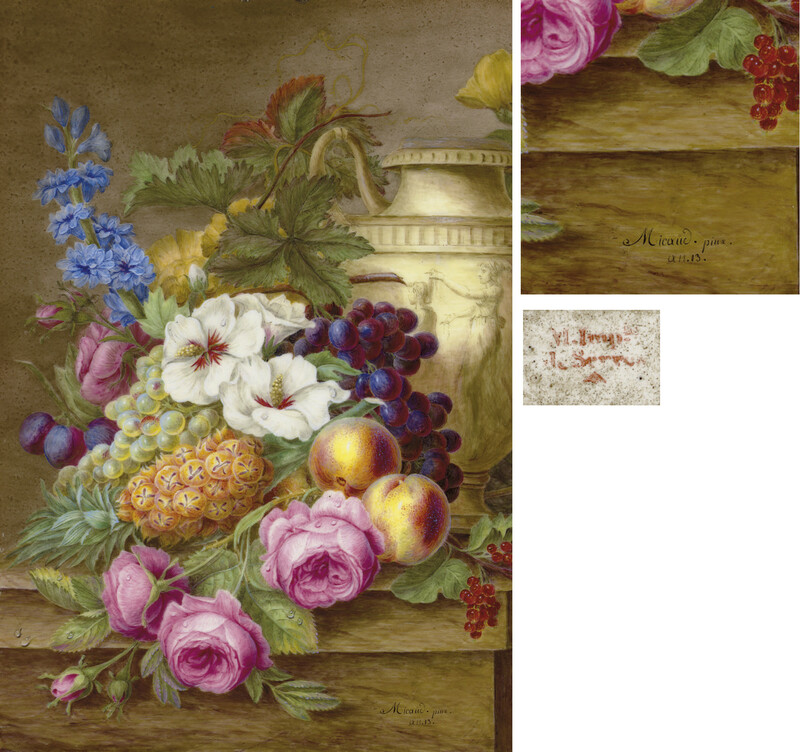 The present plaque is likely the first (and more expensive) of two rectangular tableaux entered in the Sèvres saleroom ledger on 31 December 1806 and described as painted by M. Micault with colored flowers (fleurs colorées). The first, 27 x 23 cm., was priced at 300 francs; the second, 25 x 20 cm. at 200 francs. A third similarly painted but oval in shape, was priced between these two [Register Vu1, folio 33, Nos 193.5, .6, .7]. A pair of plaques, each painted by Micaud père with baskets of similar flowers on a marble ledge, previously in the collections of J. Pierpont Morgan and of a Washington D.C. collector and in 18th century giltwood frames, were sold at Christie's, New York, 17-18 May 2005, lot 80. The artist Jean-Jacques Micaud (Micault) père is recorded at Sèvres as a flower painter 1757-1810. His mark of a stiff X with serifs is often confused with that of Philippe Xhrouet, a flower painter active 1750-1775 whose mark is a loosely executed X with no serifs. Sèvres porcelain is generally marked on the back, the manufacturing date in code, the artist identified with a cipher. Although the factory mark and date of facture appears twice on the back, the present tableau has the full signature of the artist and the date on the lower right corner of the front, an indication of the high regard in which Micaud will have been held at this point in his career. Our thanks to Tamara Préaud, head archivist at the Manufacture de Sèvres, for her assistance in researching this lot.